The looks you toss my way. How your eyes narrow and your eyebrows shoot up. I’ve felt the room quiet and tense when I walk in with my son. I’ve noticed how the class pictures, special projects, birthday parties and candid shots you share don’t include him. I feel your judgements, your distaste, your impatience, your discomfort, your dislike. Sometimes, if I’m really unlucky that day, I catch your words, hear your thoughts, get wind of your opinions. And so does my son. My child, who doesn’t act like yours, he hears you. He feels your stares, feels the isolation of being left out of the pictures, the projects, the parties. He sits alone and is not oblivious to it. Because my kid, “that kid”, he’s still a kid. He has a birthday. He has a favorite stuffed animal. He laughs at tv shows, has bad dreams, scrapes his knees, and doesn’t always want to eat his vegetables. He plays, he reads, he draws. He has Legos, he uses his sleeve like a napkin, he has dreams for when he’s a grown up and fears for right now as a kid. Because he’s still just a kid. That child, the person you resent, dislike, the boy you make assumptions about, the one you give up on before trying, he’s a kid. The boy who needs help, he’s a kid. The child who has trouble making or keeping friends, he’s a kid. The boy who so obviously doesn’t mesh with whatever environment you’re judging him in, he’s just a kid. Yet somehow it’s been decided that he’s “that kid”, the one who gets in trouble, the one who causes trouble, the one who just can’t seem to act like the other kids around him. You’ve allowed his obvious struggle to be the one trait that defines him. Kids do well when they can, and for whatever reason – or for many reasons – he can’t do well, not at what you’re asking of him. 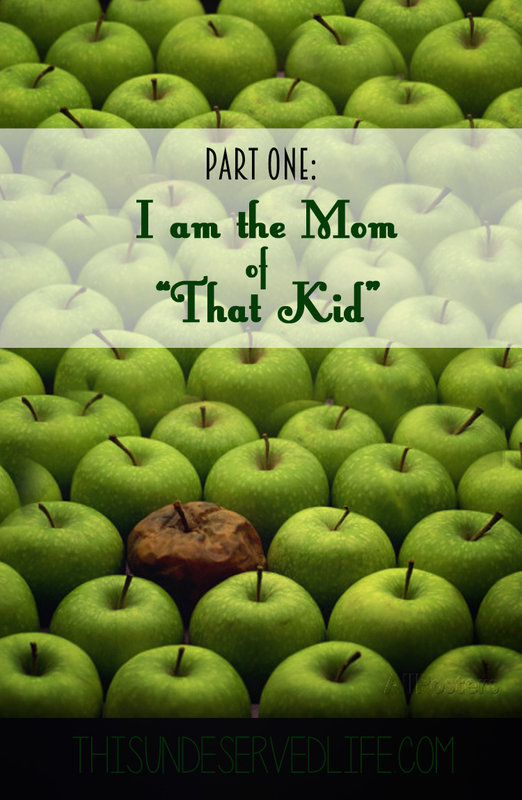 So really, when you roll your eyes, when you shun him away from your kid, when you refer to him as “that kid”, what you really mean is he’s not your kid. And you’re right, he’s not. He doesn’t act like your kid. He doesn’t have the benefit of your doubt like your kid. He doesn’t get included like your kid. He doesn’t get your advocacy like your kid. And the best part of all of it is that he isn’t your kid. He’s mine. He’s unique to us, our family, our dynamic. His struggles aren’t your job, but neither is his assessment. He is mine, my snuggly boy, my loving boy, my creative and hilarious little guy who has so much more to offer than just his classroom behavior. There isn’t a child in any classroom shared with yours who doesn’t have at least one parent aware of their child’s behavior. Your opinion isn’t needed in the raising of any of them. Yet still you stand, a little straighter when you see him, in judgement. Casting your thoughts down upon a child. Narrowing your eyes to create a tunnel vision that only allows you to see what he struggles most with, allows you to place sanctimonious blinders on and miss the great things about him in your peripheral. You feel indignation towards him, as though “that kid” is a wrong that needs to be righted. The superiority you feel in having identified “that kid” fills you with comfort and relief that it isn’t your kid. So you avoid him, judge him, make assumptions about myself and our home. You expect the worst and are irritated when you’re proven right. Because my boy can’t act like your kid. He isn’t like the other kids. He does struggle, daily… with issues you haven’t even bothered to consider. Maybe the kid who won’t talk to you has a speech delay. Maybe the girl who flinches away from you has a sensory processing disorder. Maybe the boy who ignites in anger has a legitimate emotional disorder. Maybe the girl who won’t stop talking at inappropriate times is just looking for someone to listen because no one at home does. Maybe the bully is being abused. Maybe the kid who brought the wrong snack didn’t have anyone at home to help him. Maybe the grumpy guy in the corner didn’t get enough sleep. Maybe the clingy kid on every field trip isn’t handling her parents’ divorce. Maybe the boy who asks for everyone else’s leftovers is eating the only meal he’ll get that day. Maybe the sweet little boy who sits away from everyone has a mind that far exceeds his abilities to control. Maybe their behavior is telling us something, not backing up your opinion. Maybe “that kid” is “that hurting kid”, “that hungry kid”, “that lonely kid”, “that kid in therapy who is really trying”. Because they know they’re different, these kids. They know they’re left out, avoided, whispered about and looked down upon. And for every empty seat next to them, it reinforces their immature belief that something is wrong with them. Kids have a very narrow understanding of the world, of themselves. Much of what they think about themselves they’ve built buy comparison to others, so when others – especially adults – shun them, roll their eyes at them, or even speak harsh words, they don’t have the capacity to consider whether it’s true or not. They see they don’t act like others, they see the activities going on without them, and by comparison now believe that something is wrong with them – not the society that would avoid or blame a struggling child for being different. “That kid” stays “that kid” because you keep treating him like “that kid”. Imagine if we stopped resenting “that kid” and started remembering they’re JUST a kid. Imagine if we stopped searching for ways to be RIGHT about them and started looking for ways to be KIND to them. They’re different from your kid, and that’s okay. They’re not fitting into the mold, and that’s okay. They’re most certainly lonely, and that’s not okay. Kids are not the people to shun or judge, and what does it say about us as adults if we’re holding so tightly on to wanting to? Again, kids do well when they can. So let’s stop putting up social roadblocks that make it even harder for them to do well. I’m not expecting invitations for play dates, but a smile instead of a scowl wouldn’t kill ya. My struggling apple won’t spoil your whole bunch. I love you and “that kid”! You would not believe the amount of Amens I threw up! Your kid is not my kid, but we have been there. Hang tough momma! God gives them to us because we are what they need! “That kid” as well as your other kids, will be the ones to stand against the tide and say, “Not on my watch.” They know the struggle and will stand up for future strugglers. Seriously. Just keep loving them! And thank God they are not the norm. Next Next post: So What Now?